QUT's Schools of Design and Education recently collaborated to host a studio for teachers preparing for the 2019 Queensland Senior Design syllabus. Eighty high school teachers from Brisbane and regional schools across Queensland attended the Design Teachers Studio Workshop in February in the Interior Design studios at QUT Gardens Point Campus. Design is a new General subject that schools throughout Queensland can elect to offer Year 11 and 12 students. The subject is structured to help students become effective problem-solvers and future designers. The new curriculum has been prepared for implementation by the Queensland Curriculum and Assessment Authority (QCAA), alongside the introduction of Queensland’s new senior assessment and tertiary entrance systems. According to the QCAA syllabus, Australia needs, “enterprising and innovative individuals with the ability to make discerning decisions concerning the development, use and impact of technologies”. 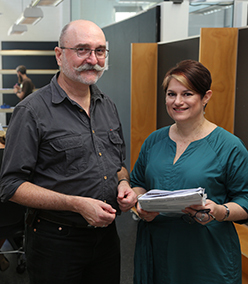 QUT Design co-organisers Natalie Wright and Andrew Scott worked with Nick Kelly from QUT Education to create the on-campus studio experience. The QUT workshop program included team-building and design brief writing exercises, as well as inquiry, ideation and iteration activities with professional facilitators, presentations, panel discussions and a campus workshop tour. Ingham State High School teacher Jason Brown attended the two-day program, and said he could see the value in the program. “It’s a great networking experience. It was about skill building, making connections, and expanding opportunities for students,” Mr Brown said. Program co-organiser Natalie Wright said that the development of design-thinking capabilities will become ever more important in preparing our twenty-first century workforce to navigate uncertain and challenging futures. “Design teachers will increasingly play a critical role in nurturing the knowledge, skills and mindsets for our nation to thrive”, Ms Wright said. “We hope that by building connections and sharing knowledge within the education ecosystem, we can assist teachers of home economics, graphics and design and technology in the transition to the new Design Syllabus”. Andrew Scott, program co-organiser said the design syllabus represents a significant departure from its predecessors and a substantial challenge for teachers interested in delivering it. Mr Scott said the School of Design is well placed to assist teachers in understanding design and how it is taught and practiced in a broad range of design disciplines. “The workshop allowed us to draw on many of our most experienced lecturers and tutors to share design teaching ideas and approaches from architecture, fashion, industrial design, interactive and visual design, interior design, and landscape architecture," Mr Scott said. "It was tremendously rewarding to work with such talented and committed teachers from both the tertiary and secondary sectors." The team are reviewing feedback from this event and discussing where and when to hold future events. Associated research will investigate the professional development of the design teacher.